Super Hero Boy: My child is going to be a musical genius.. or at least this toy makes it sound as if he is..
My child is going to be a musical genius.. or at least this toy makes it sound as if he is..
Connor loves musical light up gadgets and toys of course. I alway struggle with them as some toys with sound are SOO loud, though I tolerate them on his behalf. The Munckin Mozart Magic Cube on the other hand is not just tolerable but I find it as fun as he does! It looks like a huge block, diffrent colors on each side with diffrent instruments. Simple enough, but what gets really exciting is if you start pressing each instrument in diffrent orders. IF you just press the piano you will hear a piano playing one of several songs (all of the classical variety.. nothing that you will hate I promise) the button itself lights up along with the music. Here is where it gets really fun, if you push any (or all) of the other buttons along with the piano you can add on instruments and lights to your own little orchestra all playing along with each other. It's really a lot of fun, even more so than I ever imagined. The cube itself is sitting on my desk as I type and I love to experiment with the diffrent instruments even when Connor is not around. Its nice and portable so it makes an EXCELLENT car toy as well. Don't worry those little colored dots on each corner of the cube are actually soft bumpers so if your son/daughter chucks it at his/her brother or sister in the back of the car it won't hurt so bad. The only downfall I see to this cube at all is that there is no volume switch. Though it is not outrageously loud it would be nice to be able to turn it down for in the car. 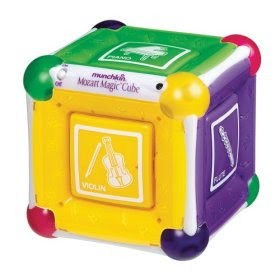 The Munckin Mozart Magic Cube is available on Amazon as well as I saw it for sale at Target this week! You can also go online at Munckin to use their store locator. Sophia played with this till it literally broke. I was so sad when the plastic peice cracked around the on off switch. We had to ditch it... I need to get another one for sagan!